This document describes CULA™, an implementation of the Linear Algebra PACKage (LAPACK) interface for CUDA™-enabled NVIDIA® graphics processing units (GPUs). CULA is a next-generation linear algebra package that uses the GPU as a co-processor to achieve speedups over existing linear algebra packages. CULA provides the same functionality you receive with your existing package, only at a greater speed. Standard - The functions in this interface work on data in main memory, as in the Netlib LAPACK interface, but with semantics more familiar to the C and C++ programmer. Device - This interface follows the standards set forth in the NVIDIA CUBLAS package. In this interface, the user allocates and populates GPU memory and then calls CULA functions to operate on that memory. This is useful for closed-loop GPU systems that do large sections of processing on the GPU. Fortran - This functions of this interface match the Standard and Device interfaces but use Fortran calling conventions. Link - This interface is targeted at users who are porting existing linear algebra codes to a GPU-accelerated environment. This interface provides a migration path by matching the function names and signatures of several popular linear algebra packages. It additionally provides a fallback to CPU execution when a user does not have a GPU or when problem size is too small to take advantage of GPU execution. For maximum compatibility with the conventions of existing linear algebra packages, CULA uses column-major data storage and 1-based indexing, even on our C-oriented interfaces. More details are available in the Programming Considerations chapter. The official release of CULA is available in several forms. Dense Free Edition - The basic package contains a basic set of functions and is free of cost. This version supports single-precision real and complex data types. Dense - The standard package is a low-cost solution that provides a greater set of functionality than the Free Edition package and includes all data precisions. This package is intended for institutional and academic use. Precisions in the table above are defined as follows (more details available later): S is single precision real, D is is double precision real, C is single precision complex, and Z is double precision complex. CULA’s standard Dense edition implements a much larger set of functions from LAPACK. As CULA evolves, more functions and function variants will be supported. CULA contains the following LAPACK function equivalents from the symmetric Eigenproblem family of computational routines. CULA contains the following LAPACK function equivalents from the generalized Eigenproblem family of computational routines. Please provide feedback on any other systems on which you attempt to use CULA. Although we are continually testing CULA on other systems, at present we officially support the above list. If your system is not listed, please let us know through the provided feedback channels. This work has been made possible by the NASA Small Business Innovation Research (SBIR) program. We recognize NVIDIA for their support. CULA is built on NVIDIA CUDA and NVIDIA CUBLAS. For more information, please see the CUDA product page at http://www.nvidia.com/object/cuda_home.html. CULA uses the Intel® Math Kernel Library (MKL) internally. For more information, please see the MKL product page at http://www.intel.com/software/products/mkl. The original version of LAPACK from which CULA implements a similar interface can be obtained at http://www.netlib.org/lapack. This is a legal agreement (“Agreement”) between either a Subscriber or a Licensee, the party licensing either CULA Dense Free Edition or CULA Dense or CULA Sparse, and EM PHOTONICS Inc., a Delaware corporation with its principal place of business at 51 East Main Street, Newark, Delaware, 19711 (“Licensor”). BY CLICKING ON THE “AGREE” BUTTON BELOW AND PRESSING THE ENTER KEY, YOU ACKNOWLEDGE THAT YOU HAVE READ ALL OF THE TERMS AND CONDITIONS OF THIS AGREEMENT, UNDERSTAND THEM, AND AGREE TO BE LEGALLY BOUND BY THEM. If you do not agree with the terms of this Agreement, you may not download, install, use or distribute either CULA Dense Free Edition or CULA Dense or CULA Sparse, as applicable. 1.1 “Commercial Purpose” means the use, reproduction or distribution, directly or indirectly, of the Software, or any portion of the foregoing, that is intended to result in a direct or indirect pecuniary gain or any other consideration or economic benefit to any person or entity involved in such use, reproduction or distribution. Examples of a Commercial Purpose, include without limitation, (v) integrating the Software with other software or hardware for sale, (w) licensing the Software for a fee, (x) using the Software to provide a service to a third party, (y) selling the Software, or (z) distributing the Software for use with other products or other services. 1.2 “CULA Dense Free Edition” means Licensor’s limited, pre-complied implementation of linear algebra routines for certain third party graphics processing units. 1.3 “CULA Dense” means Licensor’s more expanded, pre-compiled implementation of linear algebra routines for certain third party graphic processing units. 1.4 “CULA Sparse” means Licensor’s pre-compiled implementation of sparse linear algebra routines for certain third party graphic processing units. 1.5 “Licensee” shall mean an individual or entity who has registered as a Licensee on www.culatools.com/register to use CULA Dense or CULA Sparse and who has paid the applicable license fees for such use. 1.6 “Intellectual Property Rights” shall mean all proprietary rights, including all patents, trademarks, copyrights, know-how, trade secrets, mask works, including all applications and registrations thereto, and any other similar protected rights in any country. 1.7 “Software” means collectively the CULA Dense Free Edition and the CULA Dense and the CULA Sparse. 1.8 “Subscriber” shall mean an individual or entity who has registered as a subscriber on www.culatools.com/register to use CULA Dense Free Edition. reproduce CULA Dense Free Edition and/or the Documentation as strictly necessary in exercising its rights under this Section 2.1.
reproduce CULA Dense and/or the Documentation as strictly necessary in exercising its rights under this Section 2.2. You as an individual may install and use the CULA Dense on an unlimited number of computers provided that only one copy of the CULA Dense is in use at any one time. A separate license is required for each additional use in all other cases. If you are an entity, you may designate one individual within your organization to have the sole right to use the CULA Dense in the manner provided above. reproduce CULA Sparse and/or the Documentation as strictly necessary in exercising its rights under this Section 2.3. You as an individual may install and use the CULA Sparse on an unlimited number of computers provided that only one copy of the CULA Sparse is in use at any one time. A separate license is required for each additional use in all other cases. If you are an entity, you may designate one individual within your organization to have the sole right to use the CULA Sparse in the manner provided above. alter or remove any copyright notice or proprietary legend contained in or on the Software. Paragraphs (a) though (e) of this Section 2.4 are collectively referred to as the “Restricted Activities”). any and all notices referencing this Agreement and absence of warranties. 2.6 Distribution Obligations. The Distributable Files may be distributed pursuant to Section 2.1(b), and any use of such Distributable Files by a recipient must be governed by the terms and conditions of this Agreement. Each Subscriber must include a copy of this Agreement with every copy of the Distributable Files it distributes. Under no circumstance may a Subscriber or Licensee distribute CULA Dense or CULA Sparse or any files comprising CULA Dense Free Edition not identified on Exhibit A. Each Subscriber must duplicate the notice in Exhibit A with the Distributable Files in a location (such as a relevant directory) where a user would be likely to look for such a notice. 3 Ownership of Software and Intellectual Property Rights. All right, title and interest to the Software and the Documentation, and all copies thereof, are and shall remain the exclusive property of Licensor and/or its licensors or suppliers. The Software is copyrighted and protected by the laws of the United States and other countries, and international treaty provisions. Licensor may make changes to the Software, or to items referenced therein, at any time and without notice, and Licensor is not obligated to support and/or update the Software or the Documentation unless otherwise agreed to herein. Except as otherwise expressly provided, Licensor grants no express or implied right or license (whether by implication, inducement, estoppel or otherwise) under any Licensor patents, copyrights, trademarks, or other intellectual property rights. 3.1 Feedback. While neither Party is required to provide the other party any suggestions, comments or other feedback regarding the Software, the Documentation or a Subscriber’s and/or Licensee’s use or implementation of the Software and/or Documentation (“Feedback”), to the extent a Subscriber or a Licensee provides Feedback to the Licensor, Licensor may use and include any Feedback so provided to improve the Software or other Licensor technologies and any new features, functionality, or performance based upon the Feedback that Licensor subsequently incorporates into its products shall be the sole and exclusive property of Licensor. Accordingly, if a Subscriber and/or Licensee provide Feedback, such Subscriber and/or Licensee hereby agrees that Licensor may freely use, reproduce, license, distribute, and otherwise commercialize the Feedback in the Software or other related technologies without the payment of any royalties or fees. 3.2 No Reverse Engineering and other Restrictions. In addition to agreeing to restrictions in Section 2.4 above, each Subscriber and/or Licensee shall not directly or indirectly: (i) sell, lease, redistribute or transfer any of the Software or Documentation; (ii) modify, translate, reverse engineer (except to the limited extent permitted by law), decompile, disassemble, create derivative works based on, sublicense, or distribute any of the Software; (iii) rent or lease any rights in any of the Software or Documentation in any form to any person; (iv) use any Software for the benefit of any third parties (e.g., in an ASP, outsourcing or service bureau relationship) or in any way other than in its intended manner; (v) remove, alter or obscure any proprietary or copyright notice, labels, or marks on the hardware components of the Software or Documentation; or (vi) disable or circumvent any access control or related security measure, process or procedure established with respect to the Software or any other part thereof. Each Subscriber and/or Licensee is responsible for all use of the Software and the Documentation and any downloading, installing and using the Software and for compliance with this Agreement; any breach by any user shall be deemed to have been made by the applicable Subscriber and/or Licensee. 4 Third Party Licenses. This Software includes third-party software, listed in Exhibit B, that is governed by a separate license agreement. By using the CULA software and accepting this Agreement, you additionally agree to adhere to the license agreements for each of the software products. Where required by a third-party license, source code for these products are made available within this Software package. A Licensee may subscribe to Licensor’s CULA Dense maintenance and support program by paying Licensor the then-applicable annual maintenance and support fee (the “Support Fee”). Upon payment of the Support Fee, Licensor shall provide Licensee with the applicable level of maintenance and support services set forth in the support program. Any CULA Dense updates provided to Licensee pursuant to the support program shall be deemed part of the CULA Dense and shall be licensed under the terms and conditions of the CULA Dense. A Licensee may subscribe to Licensor’s CULA Sparse maintenance and support program by paying Licensor the then-applicable annual maintenance and support fee (the “Support Fee”). Upon payment of the Support Fee, Licensor shall provide Licensee with the applicable level of maintenance and support services set forth in the support program. Any CULA Sparse updates provided to Licensee pursuant to the support program shall be deemed part of the CULA Sparse and shall be licensed under the terms and conditions of the CULA Sparse. 6 Payments. Licensee agrees to pay amounts invoiced by Licensor for any CULA Dense and/or CULA Sparse made available pursuant to this Agreement. If any authority imposes a duty, tax or similar levy (other than taxes based on Licensor’s income), Licensee agrees to pay, or to promptly reimburse Licensor for, all such amounts. Unless otherwise indicated in an invoice, all Licensor invoices are payable thirty (30) days from the date of the invoice. Licensor reserves the right to charge a late payment in the event Licensee fails to remit payments when due. 7 Confidentiality. “Confidential Information” means any non-public technical or business information of a party, including without limitation any information relating to a party’s techniques, algorithms, software, know-how, current and future products and services, research, engineering, vulnerabilities, designs, financial information, procurement requirements, manufacturing, customer lists, business forecasts, marketing plans and information. Each Party shall maintain in confidence all Confidential Information of the disclosing Party that is delivered to the receiving Party and will not use such Confidential Information except as expressly permitted herein. Each Party will take all reasonable measures to maintain the confidentiality of such Confidential Information, but in no event less than the measures it uses to protect its own Confidential Information. 7.1 Each Subscriber and/or Licensee hereby agrees that the Licensor shall be free to use any general knowledge, skills and experience, (including, but not limited to, ideas, concepts, know-how, or techniques) (“Residuals”), contained in any (i)_ Subscriber and/or Licensee Confidential Information, (ii) Feedback provided by a Subscriber and/or Licensee; (iii) Subscriber’s and/or Licensee’s products shared or disclosed to Licensor in connection with the Feedback, in each case, which are retained in the memories of Licensor’s employees, agents, or contractors who have had access to such materials. Licensor shall have no obligation to limit or restrict the assignment of its employees, agents or contractors or to pay royalties for any work resulting from the use of Residuals. 8 Limited Warranty and Disclaimer. 8.1 NO WARRANTIES. THE SOFTWARE IS PROVIDED “AS IS” WITHOUT ANY EXPRESS OR IMPLIED WARRANTY OF ANY KIND, INCLUDING WARRANTIES OF MERCHANTABILITY, NONINFRINGEMENT, OR FITNESS FOR A PARTICULAR PURPOSE. Licensor does not warrant or assume responsibility for the accuracy or completeness of any information, text, graphics, links or other items contained within the Software. Licensor does not represent that errors or other defects will be identified or corrected. 8.2 LIMITATION OF LIABILITY. EXCEPT WITH RESPECT TO THE MISUSE OF THE OTHER PARTY’S INTELLECTUAL PROPERTY OR DISCLOSURE OF THE OTHER PARTY’S CONFIDENTIAL INFORMATION IN BREACH OF THIS AGREEMENT, IN NO EVENT SHALL LICENSOR, SUBSIDIARIES, LICENSORS, OR ITS SUPPLIERS BE LIABLE FOR ANY DAMAGES WHATSOEVER (INCLUDING, WITHOUT LIMITATION, INDIRECT, LOST PROFITS, CONSEQUENTIAL, BUSINESS INTERRUPTION OR LOST INFORMATION) ARISING OUT OF THE USE OF OR INABILITY TO USE THE SOFTWARE, EVEN IF LICENSOR HAS BEEN ADVISED OF THE POSSIBILITY OF SUCH DAMAGES. SOME JURISDICTIONS PROHIBIT EXCLUSION OR LIMITATION OF LIABILITY FOR IMPLIED WARRANTIES OR CONSEQUENTIAL OR INCIDENTAL DAMAGES, SO THE ABOVE LIMITATION MAY NOT APPLY TO SCRIBER AND/OR LICENSEE. SUBSCRIBER AND/OR LICENSEE MAY ALSO HAVE OTHER LEGAL RIGHTS THAT VARY FROM JURISDICTION TO JURISDICTION. NOTWITHSTANDING THE FOREGOING, LICENSOR’S AGGREGATE LIABILITY ARISING OUT OF THIS AGREEMENT SHALL NOT EXCEED ONE HUNDRED UNITED STATES DOLLARS (USD$100). 9.1 Term. The term of this Agreement shall commence on the Effective Date and shall expire on the first (1st) anniversary of the Effective Date (the “Initial Term”). This Agreement shall automatically renew for successive one (1) year periods (the “Renewal Term,” and together with the Initial Term, the “Term”) unless Licensee provides Licensor with notice of non-renewal at least thirty (30) calendar days prior to its expiration. Breach. Either Party may terminate this Agreement upon thirty (30) days’ prior written notice if the other Party materially breaches this Agreement and does not cure such breach within thirty (30) days following receipt of notice specifying the breach. Insolvency. Either Party may also have the right to terminate this Agreement in the event the other party (i) becomes insolvent, (ii) becomes subject to a petition in bankruptcy filed by or against it that is not dismissed within thirty days of the filing of such petition, (iii) is placed under the control of a receiver, liquidator or committee of creditors, or (iv) dissolves, ceases to function as a going concern or to conduct its business in the normal course. 9.3 Effect of Termination. Upon the expiration or termination of this Agreement, Customer agrees to pay all amounts accrued or otherwise owing to Licensor on the date of termination, and each Party shall return, or certify the destruction of, the Confidential Information of the other Party. In the event a support program is in place at the effective date of termination, Licensor agrees to continue providing maintenance and support under the terms of this Agreement and the applicable Support Plan through the expiration date of such Support Plan. Termination in accordance with this Agreement shall be without prejudice to any other rights or remedies of the Parties. 10.1 Legal Compliance; Restricted Rights. Each Party agrees to comply with all applicable Laws. Without limiting the foregoing, Customer agrees to comply with all U.S. export Laws and applicable export Laws of its locality (if Customer is not located in the United States), and Customer agrees not to export any Network Appliances, Software or other materials provided by Licensor without first obtaining all required authorizations or licenses. The Network Appliances and Software provided to the United States government are provided with only “LIMITED RIGHTS” and “RESTRICTED RIGHTS” as defined in FAR 52.227-14 if the commercial terms are deemed not to apply. 10.2 Governing Law; Severability. This Agreement shall be governed by the laws of the State of New Jersey, USA, without regard to choice-of-law provisions. If any provision of this Agreement is held to be illegal or unenforceable for any reason, then such provision shall be deemed to be restated so as to be enforceable to the maximum extent permissible under law, and the remainder of this Agreement shall remain in full force and effect. Each Subscriber and/Licensee and Licensor agree that this Agreement shall not be governed by the U.N. Convention on Contracts for the International Sale of Goods. Any and all proceedings relating to the subject matter of this Agreement shall be maintained in the courts of the State of Delaware or Federal District Courts sitting in the District of Delaware, which courts shall have exclusive jurisdiction for such purpose, and Subscriber and/or Licensee hereby consents to the personal jurisdiction of such courts. 10.3 Notices. Any notices under this Agreement will be personally delivered or sent by certified or registered mail, return receipt requested, or by nationally recognized overnight express courier, to the address specified herein or such other address as a Party may specify in writing. Such notices will be effective upon receipt, which may be shown by confirmation of delivery. All notices to Licensor shall be sent to the attention of General Counsel (unless otherwise specified by Licensor). 10.4 Assignment. Neither Party may assign or otherwise transfer this Agreement without the other Party’s prior written consent, which consent shall not be unreasonably withheld, conditioned or delayed. Notwithstanding the foregoing, either Party may assign this Agreement without the consent of the other Party if a majority of its outstanding voting capital stock is sold to a third party, or if it sells all or substantially all of its assets or if there is otherwise a change of control. This Agreement shall be binding upon and inure to the benefit of the Parties’ successors and permitted assigns. 10.5 Force Majeure. Neither Party shall be liable for any delay or failure due to a force majeure event and other causes beyond its reasonable control. This provision shall not apply to any of Customer’s payment obligations. 10.6 Counterparts. This Agreement may be executed in counterparts, each of which will be deemed an original, but all of which together will constitute one and the same instrument. This Agreement may be executed by facsimile or scanned signatures. 10.7 General. This Agreement, including its exhibits (all of which are incorporated herein), are collectively the Parties’ complete agreement regarding its subject matter, superseding any prior oral or written communications. Amendments or changes to this Agreement must be in mutually executed writings to be effective. The individual executing this Agreement on behalf of the Customer has the requisite power and authority to sign this Agreement on behalf of Customer. The Parties agree that, to the extent any Customer purchase or sales order contains terms or conditions that conflict with, or supplement, this Agreement, such terms and conditions shall be void and have no effect, and the provisions of this Agreement shall control. Unless otherwise expressly set forth in an exhibit that is executed by the Parties, this Agreement shall control in the event of any conflict with an exhibit. Sections 2, 3, 5, 6, 7, 8, 9 and 10 and all warranty disclaimers, use restrictions and provisions relating to Licensor’s intellectual property ownership, shall survive the termination or expiration of this Agreement. The Parties are independent contractors for all purposes under this Agreement. The contents of this file are subject to the Software License Agreement (the “Agreement”). You may not use this file except in compliance with the Agreement. Software distributed under the Agreement is distributed on an “AS IS” basis, WITHOUT WARRANTY OF ANY KIND, either express or implied. See the Agreement for the specific language governing rights and limitations under the Agreement. The developer of the CULA Dense Free Edition, CULA Dense, and CULA Sparse is EM Photonics, Inc., a Delaware corporation. 2009 - 2012 Copyright EM Photonics, Inc. All Rights Reserved. CULATOOLS(TM), CULA(TM), the EM Photonics logo, and certain other trademarks and logos are trademarks or registered trademarks of EM Photonics, Inc. in the United States and other countries. Note: A printer friendly version of this Agreement is available in RTF format. CULA Dense Free Edition Files Re-distributable Pursuant to Section 2.1 (b). CULA Dense Files Files Re-distributable Pursuant to Section 2.2 (b). CULA Sparse Files Re-distributable Pursuant to Section 2.3 (b). None, except for Third Party content as listed in Exhibit B. To Redistribute CULA Sparse please contact EM Photonics, Inc. at info@culatools.com. Third Party Files Re-distributable Pursuant to Section 4. CULA can be downloaded from www.culatools.com. The Dense Free Edition release is available to those who register on the website. CULA Dense, which add dozens of extra LAPACK routines as well as double-precision and double-precision complex data formats, can be purchased from the CULAtools website at www.culatools.com/purchase. For vendors interested in CULA Commercial, please contact EM Photonics directly www.culatools.com/contact. CULA utilizes CUDA on an NVIDIA GPU to perform linear algebra operations. Therefore, an NVIDIA GPU with CUDA support is required to use CULA. A list of supported GPUs can be found on NVIDIA’s CUDA Enabled webpage. Support for double-precision operations requires a GPU that supports CUDA Compute Model 1.3. To find out what Compute Model your GPU supports, please refer to the NVIDIA CUDA Programming Guide. CULA’s performance is primarily influenced by the processing power of your system’s GPU, and as such a more powerful graphics card will yield better performance. Installation is completed via the downloadable installation packages. To install CULA, refer to the section below that applies to your system. Run the CULA installer and when prompted select the location to which to install. The default install location is c:\Program Files\CULAR#, where R# represents the release number of CULA. It is recommended that you run the CULA installer as an administrator in order to install to a system-level directory. The default install location is /usr/local/cula. You may wish to set up environment variables to common CULA locations. More details are available in the Configuring Your Environment chapter. As described in the Introduction, CULA presents four interfaces. This section describes the differences between the Standard and Device interfaces. The third interface (Fortran) is discussed in a later section. CULA presents two main C headers, cula_lapack.h for the standard interface and cula_lapack_device.h for the device interface. These files differ in the type of memory they accept. For the Standard interface, the pointers that these functions accept are to main memory, while in Device interface the pointers are to GPU memory. A convenience header cula.h is provided and includes all C functionality. CULA’s Standard interface automatically transfers the contents of the main memory to the GPU before beginning processing, and transfers the results back to the main memory upon completion of the operation. Due to internal memory mechanisms, this can be many times more efficient than allowing the user to pre-load the data to their GPU. However, if the programmer is building a closed-loop GPU system, the data may already be on-card and the CULA Device interface may be more convenient. CULA’s Device interface operates on pre-allocated GPU memory. This interface is intended for those who have pre-existing systems or are trying to build a closed-loop GPU processing system. These inputs are located in GPU memory and the results are placed in GPU memory. Allocation and transfers of data are the responsibility of the programmer and are performed using the CUDA API. Choose to link against cula_lapack.lib or cula_lapack_basic.lib as a link-time option. Add -lcula_lapack or -lcula_lapack_basic to your program’s link line. CULA is built as a shared library, and as such it must be visible to your runtime system. This requires that the shared library is located in a directory that is a member of your system’s runtime library path . For more detailed information regarding operating-system-specific linking procedures, please refer to the Configuring Your Environment chapter. CULA’s example projects are a good resource for learning how to set up CULA for your own project. CULA is built against NVIDIA CUDA 6.0 and ships with a copy of the CUDA 6.0 redistributable files. If you have a different version of CUDA installed, you must ensure that the CUDA runtime libraries shipped with CULA are the first visible copies to your CULA program. This can be accomplished by placing the CULA bin path earlier in your system PATH than any CUDA bin path. If a non-CUDA 6.0 runtime loads first, you will experience CULA errors. See the Checking That Libraries are Linked Correctly example for a description of how to programmatically check that the correct version is linked. After installation, CULA leaves a record to uninstall itself easily. To uninstall CULA, refer to the section below that applies to your system. From the Start Menu, navigate to the CULA menu entry under Programs, and select the Uninstall option. The CULA uninstaller will remove CULA from your system. Run the CULA installer, providing an ‘uninstall’ argument. There is no uninstallation on OS X, but you can remove the folder to which you installed CULA for a complete uninstall. If you have created environment variables with references to CULA, you may wish to remove them after uninstallation. Unlike LAPACK, CULA uses both your system’s CPU and GPU resources. Because of this difference, CULA diverges slightly from the original LAPACK interface. CULA reduces some of the complexities of traditional LAPACK interfaces, while providing the flexibility you need to manage the GPU as a compute device. This section describes the differences between CULA and LAPACK and how they affect your program. For a discussion on individual routines, see the CULA Reference Manual. CULA follows a function naming conventions that is similar but different to that of LAPACK. The primary reason for this different is so that the accelerated routines in CULA will be able to link cleanly against other linear algebra packages that supply routines that are not present in CULA. This restriction comes from linkage rules in C/C++ that dictate that there can only be one function of a given name within a program. If CULA used names that are equivalent to those of other packages, this would prevent users from compiling CULA and another linear algebra package in the same program. The function begins with cula (in lowercase). Device interface functions use an extended prefix of culaDevice. The next character (in uppercase) represents the data type. The following two characters (in lowercase) represent the matrix type. The final two to three characters (in lowercase) represent the computation performed by the routine. For example, the following call will perform CULA’s single-precision QR factorization on a general matrix. The following table outlines the matrix types specific to CULA. The following table lists the suffix for some common routines CULA provides. The full list of abbreviations can be found at the LAPACK website. In addition to using different function names, CULA has moved away from the LAPACK interface and takes arguments by value rather than by reference, which is a convention more familiar to C/C++ programmers. Additionally, this simplifies calling code by reducing the need for some temporary variables. Compared the to the traditional code, CULA uses fewer lines, has a shorter call line, and is no less clear than the traditional usage – one might argue that it is even more clear because there is less code to inspect. In addition to the Standard and Device interfaces, CULA has a third interface, Fortran, is intended to be used in Fortran programs. This interface follows the conventions of Fortran programming by taking all parameters by reference rather than by value. For more information on this interface, see Programming in Fortran. With version R12, CULA introduced the Link interface. This interface is targeted at users who are porting existing linear algebra codes to a GPU-accelerated environment. The Link interface provides a migration path by matching the function names and signatures of several popular linear algebra packages. It additionally provides a fallback to CPU execution when a user does not have a GPU or when problem size is too small to take advantage of GPU execution. For more information on this interface, see the ‘link_interface.txt’ document in the ‘doc’ directory. CULA provides support for float and float-complex data types by using C’s built-in float and the CULA type culaFloatComplex. Similarly, CULA provides support for double and double-complex data types by using C’s built-in double and the CULA type culaDoubleComplex, though these data types require support from the GPU (see System Requirements ). CUDA complex types may be used in place of CULA types by defining the preprocessor macro CULA_USE_CUDA_COMPLEX before including a CULA header. LAPACK’s error handling is accomplished through an info parameter. Upon return, this parameter specifies whether or not the function succeeded (return value of 0) and if it did not, indicates the particular parameter that is in error by stating the parameter number. Additionally, LAPACK may print an error to stdout. the co-processing device is missing a required feature to complete the requested operation. Two classes of errors that are typically reported by LAPACK are those in arguments passed to a function and those resulting from malformed data. CULA reports these errors using culaArgumentError and culaDataError return values. When this value is returned, further information about this error can be requested by calling culaGetErrorInfo, which returns an integer equivalent to that which would be returned by the analogous LAPACK function. Unlike LAPACK, CULA will not print information to stdout. Once the info code is received, a readable string may be generated by calling culaGetErrorInfoString, which accepts the CULA status code and info code to construct a human-readable string that provides an anaylsis of the error condition. Many LAPACK functions require a workspace for internal operation. For those LAPACK functions that utilize a workspace, workspace sizes are queried by providing a -1 argument to what is typically an LWORK parameter. Upon inspecting this parameter, the LAPACK function will determine the workspace required for this particular problem size and will return the value in the WORK parameter. LAPACK (and other similar packages) then require the programmer to provide a pointer to memory of sufficient size, which often requires that the programmer allocate new memory. CULA uses both main and GPU workspace memories, and as such, LAPACK’s workspace query is not appropriate, as the LAPACK interface allows for the specification of only one workspace. Instead of providing a more complicated interface that adds parameters for both main and GPU workspace memories, CULA requires neither. Instead, any workspaces that are required are allocated and tracked internally. This organization yields no significant performance loss, and furthermore reduces the number of function calls by removing the need for a workspace query. Any workspaces that have been allocated internally may be cleared by calling culaFreeBuffers(). This chapter contains a variety of subjects related to programming using CULA. Data must be in “column-major” order. Complex data must be interleaved. The following sections will briefly explain these requirements. CULA routines expect that any data provided will be stored in column-major order. While this storage scheme is also expected for LAPACK routines, column-major order may be uncommon to some programmers, especially those unfamiliar with Fortran conventions. Consider the following M-by-N matrix. 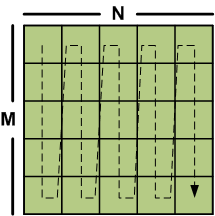 A basic M x N matrix. When storing the matrix in memory, two methods are frequently used: row-major and column-major. For many C programmers, a familiar storage pattern would involve storing the elements of a particular row first, followed by the elements of successive rows. In this storage scheme, elements of a row are contiguous in memory, while elements of a column are not. C, for example, is row-major storage by default. 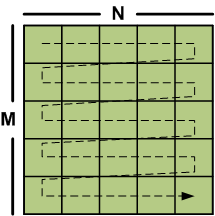 A row-major ordered matrix. Elements are stored in memory in the order shown by the arrow. Column-major ordering is the opposite of this because elements of the matrix are instead stored by column, rather than by row. In this storage scheme, elements of a column are contiguous in memory, while elements of a row are not. 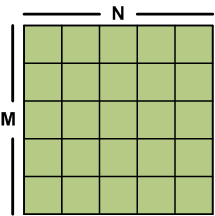 A column-major ordered matrix. Elements are stored in memory in the order shown by the arrow. As mentioned previously, CULA expects data to be represented in column-major order. Performing a transpose on the row-major data will convert it to column-major and vice-versa. Many CULA functions take a “leading dimension” argument after matrix arguments. Typically these are named LD*. For column-major data, the leading dimension the leading dimension is equal to the height of a column, or equivalently, the number of rows in the matrix. This is the height of the matrix as allocated and may be larger than the matrix used in the computation. For submatrix operations or pitched allocations, remember to report the leading dimension parameter as the number of allocated rows in the matrix. Note the differences in addressing row-major and column-major order. A[i*LDA + j] for row-major data. A[j*LDA + i] for column-major data in CULA. When working with complex data, CULA expects real and complex portions of the matrix to be interleaved. In other words, for any particular element, the real and complex parts are adjacent in memory, with the complex part being stored after the real part. This figure shows the packing of a complex data element. In memory, the real part of an element is directly followed by the complex component of that element. CULA is specifically designed to leverage the massively parallel computational resources of the GPU, with a particular focus on large problems whose execution on a standard CPU is too time consuming. As such, several considerations should be taken into account when applying CULA routines to maximize overall performance gains. Prior to the application of CULA routines it is important to consider problem size. As a general rule, applying CULA for larger problems will maximize performance gains with respect to other computational linear algebra packages. For example, consider the SGEQRF Speedups Figure. This figure shows the speedup for a selected routine versus problem size. High speedups are attained for larger problem sizes. 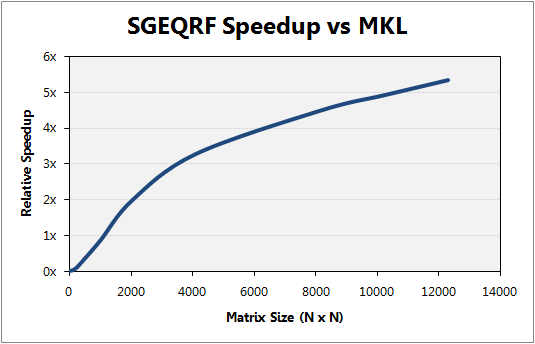 The speedup chart illustrates the performance of CULA’s QR decomposition with respect to Intel’s Math Kernel Library (MKL). Note that for the smallest problem sizes, no performance gains are seen; however, problem complexity quickly scales in such a manner that the GPU is able to outperform the CPU, for even modest problem sizes. The maximum problem size is constrained by the data type in use and the maximum GPU memory. For example, the maximum size for a problem that uses double-precision complex data is roughly one fourth of the maximum problem size of a single-precision problem for the same matrix dimensions, since the size of these data types differ by a factor of four. CULA offers both single and double-precision floating point support for its included routines. While the latest NVIDIA GPU hardware offers support for both of these data types, it should be noted that current NVIDIA GPU hardware performs best when operating on single-precision data. When applying CULA routines, the accuracy requirements of the program should be evaluated. If extended precision is required, then the use of double-precision routines is advised. For programs with more relaxed accuracy requirements, however, additional performance can be achieved at the cost of accuracy through the use of single-precision routines. CULA’s device interface allows a user to directly control GPU memory. This is useful for closed-loop GPU systems that do large sections of processing on the GPU. The device interface is not recommended to those without CUDA experience. When using the device interface, include cula_lapack_device.h instead of cula_lapack.h; see the Matrix Storage section for differences in naming conventions between the Standard and Device interfaces. Memory allocation is handled via cudaMalloc and cudaFree, available in the CUDA toolkit. If the programmer uses pitched memory, it is up to that programmer to ensure that their allocations are appropriate. CULA’s standard Dense version provides specialized allocation functions that pitch data to the optimal size for CULA. These functions are culaDeviceMalloc() and culaDeviceFree(), found in the cula_device.h header of CULA Dense. Currently, the default operating mode of CULA is to operate on only one GPU. Aside from this default mode, a programmer can manually control the way that CULA is used across the various GPU devices in their system. For a given function call, CULA currently supports single-GPU operation only. However, function calls may be made from several threads because all API functions are designed to be thread safe. Thus, you may write a program that is multithreaded, with various threads making accesses to CULA to perform their individual linear algebra operations. By default, CULA binds to the best GPU in a system. However, this binding may be manually controlled by using culaSelectDevice (found in cula_device.h). It is important to note that if a given thread is already bound to a particular GPU device, CULA cannot reset this binding, as this is a restriction of CUDA. To use multiple GPUs, multiple threads must be created. Each thread must be bound to a different GPU device by calling culaSelectDevice, with a different GPU id for each thread. After doing so, call culaInitialize in each thread, and proceed to call CULA functions as you need. Before each thread exits, ensure that culaShutdown is called in each. When using CULA, normal parallel programming rules apply. The section below outlines a few of these considerations for each of CULA’s interfaces. The Standard interface uses (traditional) main memory pointers. It is up to the programmer to ensure that CULA does not concurrently write to overlapping sections of memory; doing so will yield undefined results. The CUDA programming model specifies that a given thread may only communicate with a single GPU in a system. To follow this requirement, any call to a CUDA API function or a CULA function will “bind” that thread to that GPU (except where specified). These calls include memory allocations functions. A device pointer is only valid on a particular GPU, so care must be taken when calling CULA in a multithreaded environment. The important point is to only pass device pointers that were allocated in that particular thread context. To learn which device a thread is bound to, you may call culaGetExecutingDevice() routine found in cula_device.h. CULA provides a set of generic functions for use in C++ applications. These functions are overloaded to select a function according to the data type of its operand, allowing generic code. For every function in the cula_lapack.h and cula_lapack_device.h headers, there is a generic version of that function in the cula_lapack.hpp and cula_lapack_device.hpp headers. The generic functions will determine the type of the calling data and dispatch the operation to the appropriate typed function. Similarly to the C interfaces, a cula.hpp file is provided as a convenience header to include both the Standard and Device interfaces simultaneously if desired. Please see the Examples chapter for an example of this interface. The CULA installation contains several examples that show how to use CULA. These examples are contained in the ‘examples’ directory. This section lists several of the common use cases for CULA functions. printf("CUDA runtime version is insufficient; "
printf("CUDA driver version is insufficient; "
printf("CUBLAS runtime version is insufficient; "
This section describes the usage of CULA with the Fortran programming language. There are two ways to interface most CUDA programs with the Fortran language. CULA supports both of these methods. The first, or traditional, method is to mimic the C-style of CUDA programming. In this model, the programmer allocates data through the CUDA C runtime environment, and care must be taken to properly interface with this model. The other, more recent model, is the Portland Group’s CUDA-Fortran programming environment, in which CUDA memory is tagged with the “device” attribute but otherwise treated very similarly to other Fortran data. CULA supports both of these methods in Fortran, and provides the host memory and device memory interfaces, much as with the C-style programming mentioned throughout the rest of this guide. Routines in the CULA-Fortran interface are named identically to the C-style functions mentioned throughout this guide, with one exception: the dropCaps routine naming is replaced by a more Fortran-like style with underscores as separators, i.e., DROP_CAPS. Fortran is case insensitive and as such, drop_caps is equally applicable. Therefore the examples in this guide are largely applicable, except that a routine like culaInitialize() should be called in Fortran as CULA_INITIALIZE(). CULA provides a range of module files in the include folder. These are roughly analogous to the C-interface header files located in the same folder of the installation. A program will typically invoke one or more of these (depending on which routines are needed) via the “use” statement. The module files are preferred because array dimensionality, data types, and number of arguments will be checked properly by the compiler. Please note that array dimensions are not checked (only dimensionality is checked). It is recommended to couple the use of the module file with the “implicit none” statement in order to enforce the fullest available checking. Module files must be first be compiled because they are source code. These can be passed to your compiler like any other Fortran source code file. Only the modules that are referenced via the “use” statement in a given program should be supplied to the compiler. GFORTRAN 4.3 is the oldest compiler from the GNU Compiler Collection that supports the ISO_C_BINDING semantics required to use the CULA Fortran modules. Using a C-style CUDA memory interface in Fortran can be a difficult proposition because it requires interacting with libraries intended for a C language programming environment. The principal method for memory allocation is via a module declared with ISO_C_BINDING language extension. Modules which declare the majority of the CUDA API can be found on the Internet, but are not provided in the default CUDA installation. It is the programmer’s responsibility to properly interact with the CUDA library. An example of this integration can be found in examples/fortranDeviceInterface. With the CUDA memory allocation issues addressed, using CULA is a straightforward exercise, as the referenced example will illustrate. The experience of using the CULA library’s Device interface is exactly the same as using the CULA library’s Host interface once CUDA memory is allocated and transfered. This is the only compatible method for the Intel Fortran and GNU Fortran compilers for use of the CULA Device interface. This section describes how to set up CULA using common tools, such as Microsoft® Visual Studio®, as well as command line tools for Linux and Mac OS X. This section describes how to configure Microsoft Visual Studio to use CULA. Before following the steps within this section, take note of where you installed CULA (the default is C:\Program Files\CULA). To set up Visual Studio, you will need to set both Global- and Project-level settings. Each of these steps is described in the sections below. When inside Visual Studio, navigate to the menu bar and select Tools > Options. A window will open that offers several options; in this window, navigate to Projects and Solutions > VC++ Directories. From this dialog you will be able to configure global executable, include, and library paths, which will allow any project that you create to use CULA. The table below specifies the recommended settings for the various directories that the VC++ Directories dialog makes available. When setting up your environment, prepend the path of your CULA installation to each of the entries in the table below. For example, to set the include path for a typical installation, enter C:\Program Files\CULA\include for the Include Files field. With these global settings complete, Visual Studio will be able to include CULA files in your application. Before you can compile and link an application that uses CULA, however, you will need to set up your project to link CULA. To use CULA, you must instruct Visual Studio to link CULA to your application. To do this, right-click on your project and select Properties. From here, navigate to Configuration Properties > Linker > Input. In the Additional Dependencies field, enter “cula_lapack.lib” or “cula_lapack_basic.lib” as appropriate for your version. On the Windows platform, CULA’s libraries are distributed as a dynamic link library (DLL) (cula.dll) and an import library (cula_lapack.lib), located in the bin and lib directories of the CULA installation, respectively. By Linking cula_lapack.lib, you are instructing Visual Studio to make an association between your application and the CULA DLL, which will allow your application to use the code that is contained within the CULA DLL. Add CULA_BIN_PATH_32 or CULA_BIN_PATH_64 to your PATH environment variable. Copy cula.dll and its supporting dll’s to the working directory or your project’s executable. On a Linux system, a common way of building software is by using command line tools. This section describes how a project that is command line driven can be configured to use CULA. The first step in this process is to set up environment variables so that your build scripts can infer the location of CULA. On a Linux or Mac OS X system, a simple way to set up CULA to use environment variables. For example, on a system that uses the bourne (sh) or bash shells, add the following lines to an appropriate shell configuration file (e.g. .bashrc). After setting environment variables, you can now configure your build scripts to use CULA. You may need to reload your shell before you can use these variables. gcc ... -I$CULA_INC_PATH -L$CULA_LIB_PATH_32 . . .
gcc ... -I$CULA_INC_PATH -L$CULA_LIB_PATH_64 . . . Substitute “cula_lapack_basic” in the above commands if using that version. Add CULA_LIB_PATH_32 or CULA_LIB_PATH_64 to your LD_LIBRARY_PATH environment variable. Edit your system’s ld.so.conf (found in /etc) to include either CULA_LIB_PATH_32 or CULA_LIB_PATH_64. On the Mac OS X platform, you must edit the DYLD_LIBRARY_PATH environment variable for your shell, as above. This section lists solutions for common problems encountered when using CULA and describes your support options. How do I report information about my system? Run one of the sysinfo.bat or sysinfo.sh scripts, for Windows or Linux systems, respectively. The information these scripts report can be uploaded as an attachment to your support requests or forum posts and will aid us greatly in diagnosing your problems. An LAPACK routine I need is missing. What should I do? LAPACK is a very large library and we have only written a subset of its capabilities so far. CULA Dense is constantly growing as new functions are added. If there is function you would like to see added, contact us on our forums and voice your opinion on which functions you use. I’m having problems with my GPU and/or video drivers. Can you help? Problems specific to GPU devices and their drivers should be handled by NVIDIA. The latest drivers can always be obtained directly from NVIDIA on their Download page. CULA requires CUDA 6.0 compatible drivers (or newer) to be installed on your system. On Linux, this requires driver version 6.0.37 or newer, and for Windows it is version 6.0.37 or newer. I think I found a bug. What should I do? First, be sure that you are experiencing a software bug and not an issue related to faulty hardware or drivers. If you are still reasonably sure you have encountered a bug, see the Support Options Listed below. Your runtime system has not been set up to locate CULA. See the Linking to CULA section. culaInitialize must be called before any CULA functions may be used. Some functions have an exception to this rule, see cula_status.h for a list of these functions. Your system doesn’t have the proper hardware required to support CULA. Your system may have a non-NVIDIA GPU, may have an NVIDIA GPU that is too old, or your system may be missing the appropriate drivers for your graphics card. This error will also occur when running code that uses CULA functions over remote desktop in Windows, as the CUDA runtime currently doesn’t support GPU execution over remote desktop. This error indicates that the GPU driver or library dependencies are too old or is too limited to run this code. See the Checking That Libraries are Linked Correctly example for how to programmatically check these dependencies. If the driver is insufficient, update your drivers a newer package, available at NVIDIA’s website. Note that CULA ships with the libraries it requires, and therefore this error may indicate that a user’s path is incorrectly configured to link against these dependencies. See the Linking to CULA section for a discussion of how this problem can be fixed. Your GPU doesn’t support a required feature to complete this operation. Most commonly, this is returned when trying to run a double-precision operation on a GPU that doesn’t have double-precision hardware. Your GPU doesn’t have enough memory to complete the operation. Consider purchasing a GPU with more memory. The requested variant of a given routine hasn’t been implemented by the CULA developers. While most functions have feature-parity with respect to Netlib, this may be the case in an uncommon variant of a function. Your input to one of CULA’s routines is incorrect. The faulty parameter is reported by culaGetErrorInfo; ensure that all of your parameters are correct. See the Error Handling section. An input to one of CULA’s routines is malformed or singular. More information about the error is reported by culaGetErrorInfo. See the Error Handling section. CUBLAS has returned an error. Please file a bug report. The most common cause of this error is related to improperly configured or old GPU drivers. Ensure that you system is up to date by installing the latest drivers from NVIDIA. If you have made sure that your drivers are up to date, you can learn more about this particular error by calling culaGetErrorInfo. The value returned here will correspond to a CUDA runtime API error code; see driver_types.h in the CUDA toolkit for these codes. See the Checking That Libraries are Linked Correctly example for how to programmatically check if the GPU driver is sufficient. If this does not solve your problem, please file a bug report. If none of the entries above solve your issue, you can seek technical support. See your license level below to learn about your support options. Free Edition - Free Edition users may post problems to the CULA forums for community support. CULA Dense - Paid users can submit support tickets through the CULA website to receive personalized help. Integrators - Commercial users have direct support. Please contact your support representative directly for help with your issue. Improved: All routines retuned for Fermi. Gains of up to 100% are available. © Copyright 2009-2013, EM Photonics, Inc.. Created using Sphinx 1.0.7.